Here is a very common scenario. Someone calls me up for “advice”. They tell me that the police want to talk to them about an incident. I ask them to tell me what happened. Don’t sugar coat it. Just tell me what happened. They often give a very abridged version of the event. The advice is almost always going to be the same. Don’t talk to the cops. Instead, hire a lawyer to protect you. Sometimes they respond by saying “yeah, but I didn’t do anything”. Maybe that’s true however the fact that you are calling a lawyer to see if you should talk to the police tells me something in and of itself. Keep this advice in mind. 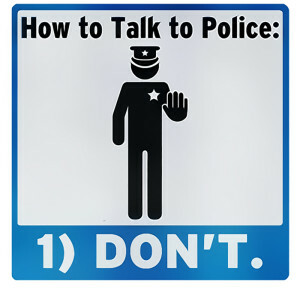 You do not have to talk to a police officer. 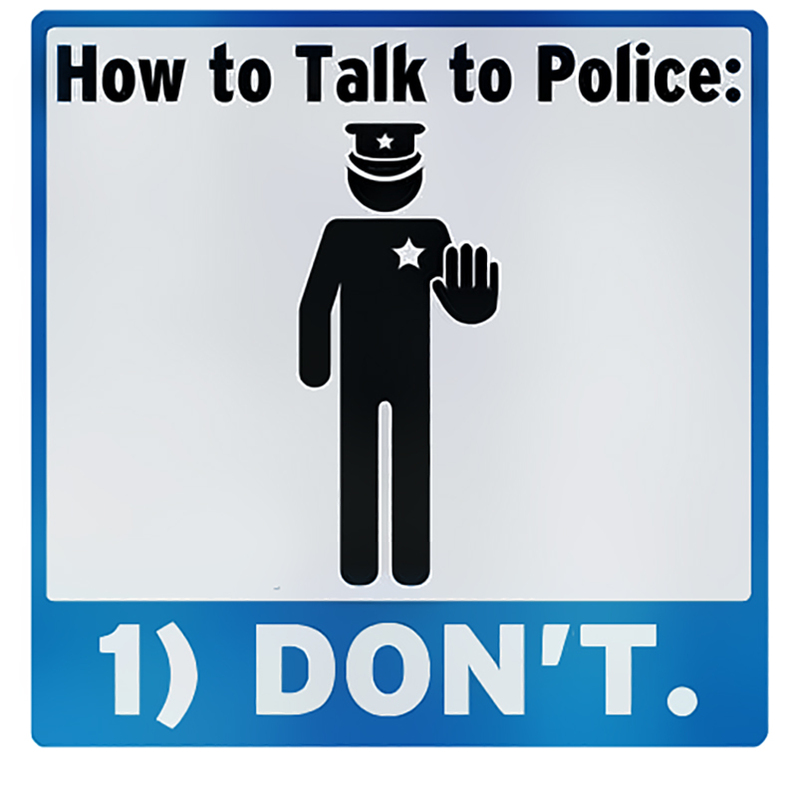 No matter what a police officer tells you, you don’t have to talk to them. Never. Many officers will tell you that if you have nothing to hide then you should talk to them. When you mention hiring a lawyer you might be told that “hiring a lawyer makes you look guilty”. After all, why would an innocent person need a lawyer? Right? Wrong. Anyone, prior to being questioned by the police should consult with a lawyer. You need to know if what you are doing is necessary. You should know what impact your statements could have on you down the road. Police officers think they know the answers to everything a witness is going to tell them. They often have preconceived ideas and they want you to simply corroborate what their theory of the case. The problem with this is however that their theory might not be what actually happened. But if you don’t tell them what they are looking for they will treat you like they think you are lying. They might pressure you into saying things that are untrue but fit within their theory of the case. If you refrain from speaking with them you can avoid these problems altogether. Just the other day a Massachusetts Supreme Judicial Court case came down, reversing a murder conviction based on a coerced statement. Commonwealth v. Donovan Smith, SJC – 11723. In that case officers interrogating a suspect lied to him about the information they had regarding the crime. The defendant told them he was done talking to them. The officers continued to interrogate him. One of the officers “launched into a lengthy monologue in an apparent effort to convince the defendant to keep talking”. The Court held that the conduct of the officers in not honoring the defendant’s constitutional rights warranted a reversal of his murder conviction. This case illustrates perfectly what you don’t want to talk to the police. They were making up unsubstantiated facts about the case to trick the defendant into talking to them. Even when the defendant wanted to invoke his right to remain silent the officers continued with their constitutional violation. The tricks worked and the defendant was convicted of murder and sentenced to life in prison. Now, thanks to a great criminal appellate lawyer and a Court that properly applied the law, the defendant gets another chance at justice. But not everybody is that lucky. So remember, you don’t have to talk to the police. Before making any decisions contact a criminal lawyer. We can be reached at all times. Call us at 617-263-6800 or send us an email. We can help you win your case.